An engraved silverplate teapot. The teapot is elaborately decorated with etched bands around the base and under the rim of the pot. 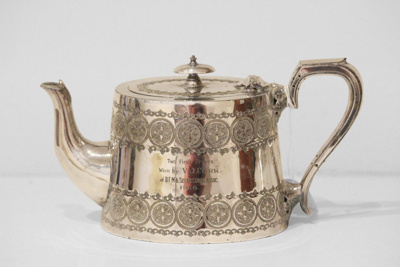 This teapot was awarded to Victor Cork in 1918 for his two 1st prizes at Dairy Farmers and Factory Managers and Secretaries Show Associations. 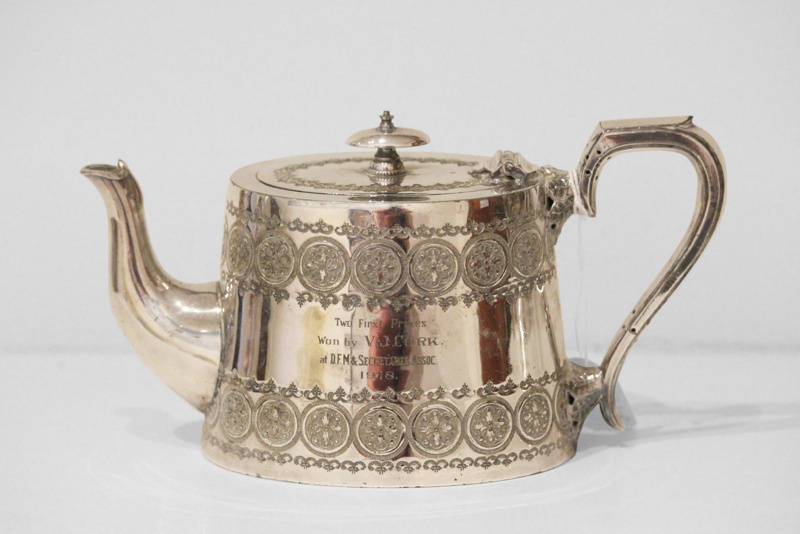 The teapot is one of the pieces of silverware awarded to Victor Cork by the Dairy Farmers and Factory Managers and Secretaries Show Association from 1916-1919. These pieces were won during the time that Victor Cork was manager of the Jamberoo Cheese Factory. Victor Cork was the first manager and cheese maker between 1914 and 1916 of the Narooma Co-operative Dairy Company, which was established at Forster’s Bay. Producing mainly 14 pound cheddar cheeses, local media noted that he "...graduated in the ABC factory, Central Tilba, which has turned out a number of highly qualified manipulators..."
at D.F.M. & Secretaries Assoc.